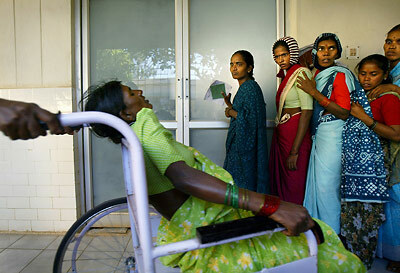 "Facing realities" Women waiting in line outside the operating room watch in shock as a patient is wheeled out of the operating room after having double puncture laporoscopic tubectomy surgery at a government-sponsored, one-day sterilization camp for poor village women at Shatnagar Hospital. The government sponsored camps are held all across the state in tiny villages. The camp travels from town to town but there are as many as four per month in one location, sterilizing from 50 to 350 women per day. A great deal of outreach work is done, especially in remote villages, to inform the women about the camp. They are offered an incentive of around $11 US for undergoing the procedure, a large sum for most of these women. Many women have to walk to the clinic, sometimes for miles on their bare feet to be sterilized.